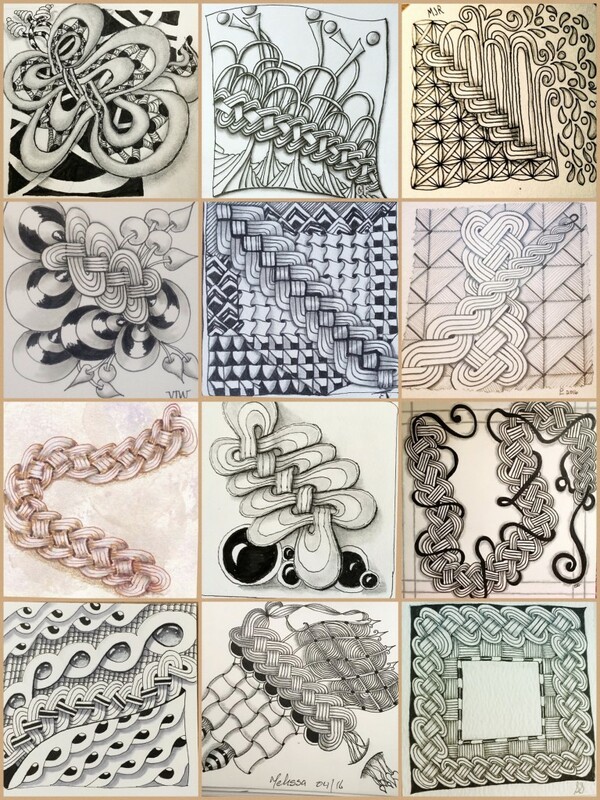 Inspired by the gorgeous Zentangle® mosaics posted at CZT23 (Zentangle Teacher training), I urged my Facebook group to participate in a small mosaic for our last week's challenge on Cruze, a tangle originally deconstructed by Caren Mlot (stepout here). Since I was away during this week, I didn't have time to create a tile with Cruze, but these are my sketches on the plane, while heading to Providence, RI. Notice how the shading is very similar to W2, darkening the edges where the ribbons go under each other. I particularly like the striped version, very dramatic. And here is our first group mosaic! Isn't it absolutely gorgeous!??? (Pictures assembled and posted with permission of group participants). I love the way how the different lighting of each picture tints the entire thing, giving a soft antique feeling. 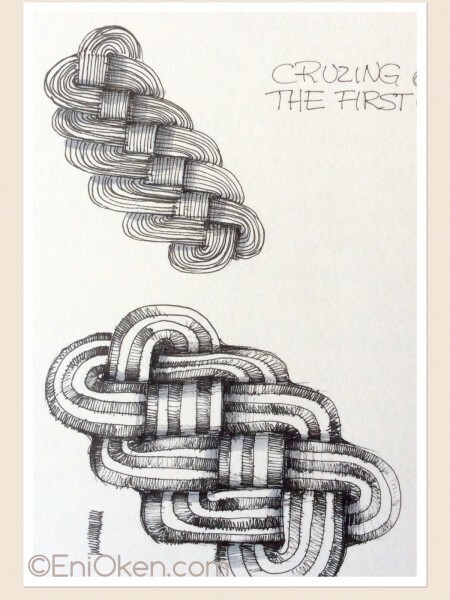 The intersting about this Cruze tangle is that although it's simply gorgeous, it's a bit tricky to integrate into specific areas of the string. It works more like a border -- curved or straight -- instead of a filler. I hope that this can be the beginning of more mosaics, I love this! If you are a member of the shading group participating in our weekly challenges and would like to have your picture in the next mosaic, then follow the instructions on the group files. You'll have to post your pictures on Instagram with the proper tags! Other copyrights are of their respective holders.